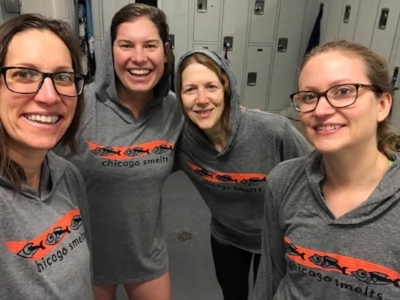 The Chicago Smelts encourage fitness, friendship, community and competition through swimming. Membership is open to everyone, including gay-friendly straight swimmers. You may join the Chicago Smelts at any time during the year and participate as much or as little as you like. We have no swim practice or swim meet attendance requirements. #1. How many swim practices do I need to attend? We have no requirements - come as often or as little as you like. The majority of our swimmers try to get in 1-3 practices/week depending on time of year and their schedule. #2. Do I have to compete in swim meets? No. About half of our team competes; the other half are fitness swimmers. Each April we make a strong push for participation in our Illinois Masters state swimming championships, but joining us is up to you. #3. I’m a newer swimmer/former high school swimmer/triathlete/etc. Is the Chicago Smelts the right team for me? Yep! We have people of all ages and abilities on the team. Complete our Visitor Registration Form and join us for a couple practices. #4. I’m gay/straight/tall/short/blue-eyed/brown-eyed, etc. Is the Chicago Smelts the right team for me? Yes! Give us a try; inclusion is one of our core beliefs. Complete our Visitor Registration Form and join us for a couple practices. #5. When are the swim meets? Our competition season is December through April each year though we offer practices year 'round. #6. What is your practice schedule? Whether you're a "morning person" or an after-work workout kind of person we have practices to suit your schedule and swimming ability. #7. Are there any pool rules of which I need to be aware? We encourage all swimmers to familiarize themselves with our Swim Practice Etiquette. Whether you're visiting from out of town or just want to see what we're about, stop by for a practice! All visitors must complete our online registration form. Please bring a receipt (print or screenshot) to your first practice and show the on-deck coach. Your Visitor Registration is good for two trial practices over a 30-day period. Visiting USMS-registered swimmers must complete this form, too. We do not charge a daily/guest fee. You are our guest. We ask that all swimmers have the ability to swim 200 yards (eight lengths) freestyle without stopping. New swimmers are welcome at any practice, but our less crowded, more comfortable practices are Tuesday, Wednesday and Thursday evenings at Gill Park and Tuesday and Thursday mornings at Jones College Prep. Please arrive at the pool 15 minutes early and introduce yourself to the on-deck coach. They'll ask you about your swim-ability and assign you to a lane. If after our warm-up you believe you should be in a faster or slower lane you're free to move up or down to suit your speed. Bring a swimsuit, cap, goggles, combination lock, towel and water bottle. We'll provide the workout.